We all think we know what to look out for when we’re online, and can think we are above being caught out by online scams. But the scammers aren’t resting on their laurels, and while we are genning up on the latest cyber scams, they are busy thinking of new ones. 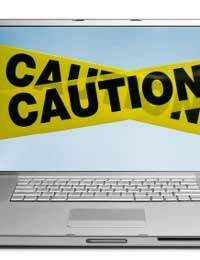 American company CIOUpdate.com decided to look into some of the newer and most lucrative online scams in November 2010, asking leading security companies and professionals about what’s going on in the online world right now, and their top tip to watch out for is coupon codes. What is the Coupon Code Scam? How many of us have got Facebook, Bebo or MySpace profiles? The best known social networking site is probably Facebook, and that makes it a target for potential scammers looking to cash in on the popularity of the site. At the very top of the list of social networking scams is the ‘coupon code’ scam that offers site users discounts on popular stores and products. The scam, found on Twitter and Facebook predominantly, spreads quickly as users come across the ‘useful’ codes and helpfully forward them on friends via tweets or Facebook posts. At busy shopping times, like Christmas, it can be tempting to try and reduce the financial burden by using vouchers and coupons to buy gifts, so the number of people who find themselves falling victim to these opportunistic scams increases. There are genuine offers out there, but the trouble is that it’s extremely hard to tell which ones are going to give you a bargain and which ones are going to steal your credit card information and make you wish you’d bought full price from the high street. The only way to avoid being caught out completely is to avoid using coupon codes at all. After all, it’s really not worth risking identity theft and the full scale plundering of your bank account just to save a few pounds. Cyber criminals use coupon code scams to get people to give out confidential information which they can exploit, and a hacker can get onto your system and make a genuine looking form pop up on your screen asking you to confirm a user name and password. With that information, they can wreak havoc on your online accounts, steal your credit card details and order goods. For this reason, you should ignore dialogue boxes that open up while you’re browsing or ordering goods online. Make sure that you close the pop up window and then log in to the genuine site separately. Check your account setting and your profile for any changes and make sure everything is as it should be. Another technique used by the cyber criminals is trying to ‘befriend’ you on social networking sites. It hardly needs to be said but you should always be wary about anyone who wants to be your ‘friend’ when you don’t know them from Adam (or Eve). For the same reason, always be suspicious of e-cards, Facebook posts or Tweets that don’t sound ‘quite right’- they may not actually be from a friend at all, even if they have your friend's name. People who phish for fake Facebook friends are after your personal information – maybe to see when you’ll be away from the house but more often they want to steal your identity. They sometimes also try and hack into your real friends' accounts and send you malware. The best way to stay protected is to keep up to date on the latest online threats, only buy online from reputable companies and ignore any coupon or deal that doesn’t look right – or seems too good to be true.